Traumatic Brain Injury (TBI) is known to initiate a series of chemical cascades resulting in both neuronal dysfunction and death. Previous in-vitro studies have shown a correlation between mechanical strain injury, accumulation of intra-cellular calcium ([Ca++]i ), and eventual cell death. Though cell death has been extensively researched, the functional state of surviving cells remains less clear. We hypothesize that in-vitro mechanical injury will alter neuronal response to a stimulating concentration of glutamate in the hours to-days post-injury. To test this we administered a biaxial mechanical strain injury (mild, moderate, or severe) to mixed neuronal-astrocytic co-cultures and analyzed levels of [Ca++]i in response to 100mm glutamate at five time points post-injury (1, 6, 24, 48, and 72 hours). Additionally we quantified cell survival 48-hours post-injury using MAP2 (neurons) and DAPI (total cells). Our data demonstrates that injured cells, regardless of injury severity, respond differently to glutamate stimulation in comparison to the control group at 1, 48 and 72 hours. Cell counts at 48 hours post-injury confirmed that the biaxial strain model creates an injury-severity related increase in both neuronal (p < 0.01) and overall (p < 0.01) cell death. These data highlight that TBI leads to neuronal death as well as abnormal responsiveness to stimulation in the cells that survive. As indicated by our data, both neuronal dysfunction and cell death are likely factors for long-term disability observed in TBI patients. Therefore there is a need to identify pharmaceutical agents that improve both neuronal viability and function following injury. The CBST internship has provided me with an extraordinary experience that made this summer both rewarding and very enjoyable. Starting the internship, I was anxious and nervous about the people I would meet and the types of activities that they had planned for us. After the first week intensive, I felt as though our group had bonded so much and it really set the tone for what was to come for the summer in the future. The weekly seminars were extremely beneficial and provided us with knowledge that was crucial for succeeding in the science, research, and medical fields. I learned a tremendous amount of knowledge from not only working specifically in lab, but through the unique and fascinating characteristics of my fellow interns. For the internship, I worked in the lab of Dr. Bruce Lyeth under the mentorship of Dr. Gene Gurkoff. My project specifically focused on studying important aspects of traumatic brain injury. The people in my lab made the experience both educational and fun. I really enjoy working with them and they are always willing to give a helping hand or to answer a question that I may have. This experience was one that I will cherish and remember far into the future. I thank all the people involved in the internship as well as the members of the Neurological Surgery lab. It was a wonderful opportunity in which I am grateful to have been given. In the interest of targeting cancer cell DNA as well as maximizing nanostructure-enhanced x-ray damage, we plan to investigate and optimize the intracellular distribution of gold nanoparticles in relation to cell nuclei. The absorption of x-rays by gold nanoparticles causes an ejection of electrons through the photoelectric effect. While in aqueous solution, these electrons generate hydroxyl radicals that diffuse to and react with DNA, causing single and double-strand breaks. Because the extent of DNA damage is related to the proximity of said nanostructures to the DNA molecules, it is essential to have the ability to easily and effectively visualize gold nanoparticles within a cell. Gold nanoparticles 7-8 nm in diameter were synthesized and rendered fluorescent through the coupling of fluoresceinyl glycine amide to carboxyl-terminated polyethylene glycol. Successful dye attachment was confirmed through alternating rounds of large and small-volume dialyses, during which free and bound ligand emissions were assayed with a fluorimeter (FluoromaxP, Jobin Yvon). DAOY cells incubated for 1 hour in a 0.1 µM solution of the gold nanoparticles were successfully imaged with a confocal microscope. As a returning summer CBST intern, I am tremendously grateful to all my mentors and the staff at CBST for making this wonderful learning opportunity possible. Apart from acquiring practical skill within lab walls, I have been forced to think hard on many levels – professionally, how to develop oneself, and more fundamentally (in the scientific/experimental sense), how to formulate useful probing questions. This year’s internship has really been special, and I am thankful to all of my fellow interns – you are truly unique, individually, and I count you all truly as my friends. You all have my sincere thanks. We are currently studying a family of cyanobacteriochromes through the use of a bacterium called Thermosynechococcus elongatus, which is a member of a family of thermophilic bacteria that contain cyanobacteriochromes. Cyanobacteriochromes contain GAF domains related to phytochromes. We are currently working with five genes from the genome of T. elongatus with class II GAF domains. GAF domains are blue/green photoreversible. This means that the organism can absorb green and blue photons, and once it is excited above a certain threshold in either color, it will reverse back to absorbing the opposite color, blue or green respectively. The genes we worked with include tlr0924, tll0569, tll0899, tlr0911, and tlr1999. All of these genes have been successfully truncated to GAF domain only and some have been expressed. I specifically worked with tlr1999 gene. Our main goal is to mutate the genes so that they no longer photoreverse when they absorb light, but instead they fluoresce. The single mutation of cysteine 499 in Tlr0924 to an aspartic acid resulted in a red light absorbing biliprotein, which is bright red fluorescent. This is essential to our area of study because we will make the homologous mutation in the GAF domains of the other genes. This can be a useful tool in mammalian organisms, and would allow the close study of mammalian tissues and cells because red fluorescence can penetrate the tissues to be viewed by imaging systems. We would like to choose the shortest, brightest red truncated GAF domain possible to introduce into mammalian cells’ actin cytoskeleton; this way, a small isolated GAF domain will not disrupt the actin of the cytoskeleton and cause malfunction, but will report subcellular events in the tissue. The chosen cyanobacteriochrome mutant that displays the correct length and brightness can, ideally, be used for mammalian expression by way of fusion to actin of the cytoskeleton of lymphocytes, then report events during lymphocyte cell infection GFP-labeled HIV. I had the pleasure of being accepted in the 2009 Summer Internship program this year. I am not a traditional age student, and I am also the first person in my family to go to college, so as one could imagine, this whole experience was a big deal for me. The experience that I received at CBST completely surpassed my expectations. All of the interns were so diverse and intelligent. It was very interesting to be around such a motivated group of people who all shared a common goal, and that goal was to strive for excellence and to take pride in a job well-done. The mentors that I had the pleasure of working with were also great. They were patient and forgiving when something didn’t go right. They were willing to teach, and I was of course willing to learn. This whole experience really deepened my understanding of the sciences and what it will take to achieve my goals. I am so fortunate to have had this opportunity, and would not hesitate to recommend it to a colleague. I really enjoyed how the director of the program, Dr. Ana Corbacho made it a point to get the interns acquainted on a personal level; because of this, we were able to learn and grow with one another for the duration of the internship. The retreat that we as interns were afforded was an enjoyable and educational experience. We were able to converse with other students in the sciences and received first-hand information about their individual experiments, as well as the journey they traveled to get to the point they are today. All in all, it was a once in a lifetime experience. I am so proud to have had the opportunity to participate in this years CBST Summer Internship Program. Angiogenesis is the process by which new blood vessels form from preexisting endothelial cells. It is an important physiological process necessary for growth and wound-healing, but also for tumor progression and survival. Cancer cells secrete soluble factors such as vascular endothelial growth factors (VEGF) and cytokines which, via VEGF receptor (VEGFR) signaling, promote endothelial cell proliferation and migration, thus recruiting supporting blood vessels to the tumor. In addition, integrins- heterodimeric cell surface receptors which mediate cell-matrix and cell-cell interactions- have been reported as playing an important role in VEFGR-stimulated tumor angiogenesis, mostly via a signaling interaction between avß3 and the receptor tyrosine kinase, VEGFR. We attempt to mimic this process in an in vitro 3D model using human umbilical vein endothelial cells (HUVEC) and a synthetic RGD-mimetic cell-signaling extracellular matrix(ECM). The arginine-glycine-aspartic acid (RGD) motif, a highly repeated sequence found in ECM proteins such as fibronectin and vitronectin, have been shown to bind to a number of integrins, including aß3, aß, and aß, all expressed v v551 in HUVEC. Using RGD-mimetic peptides and HUVEC, we investigate the role of integrin ligation in activating intracellular signals involved in the angiogenesis pathway. We found that LXW7, a cyclic high-affinity aßv3 integrin-binding RGD peptide, binds to HUVEC but does not upregulate ERK1/2, a secondary messenger that has been identified as necessary for angiogenesis. We are currently screening an RGD library to identify HUVEC-binding sequences which also induce expression of angiogenesis signaling markers; the results of which will be used to design bioactive ECM materials for inducing endothelial cell tube-formation in in vitro 3D models of angiogenesis. I expected the CBST Summer Internship to be a typical research internship where I would just work in a lab for the summer. I did not expect workshops, friendly gatherings, or a life-changing experience. However as a participant in the program I received all that and more. This program did a superb job at fostering an environment that allowed for growth within our interest in the sciences. The workshops were wonderful, the CBST retreat was an amazing experience, and the experience in the lab was invaluable. My secondary mentor challenged my knowledge and kept me on my toes which at first was a little frightening but in the end I appreciate why she did that. I learned so much about the research and the applications of that research. They were about things I have learned in a class but to actually apply that knowledge is something far more valuable than to be lectured about it. Moreover, my primary mentor was always making sure that I was learning and having fun, and together they made my experience in the lab worthwhile and interesting. One of the things I cherish most is the friendships I have made with the other interns. They are a group of wonderful people who face some of the toughest challenges and have and are overcoming major obstacles. I can honestly say that I have made a few friends who I will and want to continue keeping in touch with. Telemedicine is the transfer of medical information between patients and health care providers via telecommunication for consultation, and diagnosis. Our group has integrated a mobile device, the Apple iPhone with a microlens that provides a small and portable microscope using the existing iPhone camera sensor. This mobile microscope can be used to image micro slides that contains a patient’s blood smear sample. The image can easily be transferred via email to a health care provider for immediate diagnosis. To determine the best microlens that will produce the best resolution, we tested spherical lenses with diameters 1.0mm 2.0mm 2.5mm, and 3.0mm along with semispherical lenses with diameters 1.45mm and 2.5mm. A 3-axis microblock flexture stage was fixed onto the tabletop to hold the iPhone and control the position of the lens. A white light LED provided direct illumination for the mobile microscope. High precision ronchi rulings and a resolution target were also tested to view the distortions and resolutions associated with each lens. The 1.0mm spherical microlens exhibited the highest resolution (456.0 line pairs/mm), while the 3.0mm spherical microlens had the lowest resolution (228.0 line pairs/mm). As we were able to capture very detailed images of the blood smear sample, each of the tested microlenses had varying levels of pincushion distortions. Further work will be conducted to improve resolution and stabilize the pincushion distortions. This integrated technology will benefit patients who commute long distances to the medical office. Patients can conduct the lab work right at home. The CBST Summer Research Internship made my summer really enjoyable. I was able to conduct hands on research as well as have fun. The various workshops that were offered did help me prepare for my professional career. My mentor Sebastian Wachsmann was fantastic, who always kept on motivating me. The annual retreat at Lake Tahoe gave me an overview of the different kinds of research being done in the field of biophotonics, not to mention networking with other professionals from around the globe. I loved the research experience, considering that this is my first time conducting undergraduate research. I would like to thank the CBST Education Team as well as the staff who made this internship experience possible. If given the opportunity, I will surely go back as a summer intern. Pancreatic cancer is a silent disease that affects more than 42,000 individuals each year. The poor diagnosis and treatment for this disease is attributed to the lack of efficient imaging and therapeutic modalities. Our goal is to identify pancreatic cancer specific targeting peptide ligands, which can be conjugated with imaging and therapeutic agents, for early detection and treatment. The novel One-Bead-One-Compound (OBOC) technology, invented by Dr. Kit S. Lam, was used to synthesize peptide combinatorial libraries. By this method, millions and millions of compounds can be synthesized on bead and each bead displays a unique amino acid sequence. High affinity targeting ligands will be identified by high throughput screening OBOC libraries with pancreatic cancer cells. To perform the proposed experiment, we co-cultured 40µl of peptide library (equivalent to approximately 30,000 beads), with 1x106 cells/ml in a tissue culture dish. Beads that display positive cell adhesion are isolated, stripped, and analyzed for structure. Some of the beads from three cyclic peptides libraries (cx+G-c, cx+G-xc, c+G-xxc) showed strong binding to adenocarcinoma pancreatic cell lines: Panc1, Hpanc, and Mia Capa-2. Once the ligands are identified by sequencing we will synthesize these peptides with a biotin tag at the carboxy terminal for further analysis. Flow cytometry will be used to determine the binding affinity constant for the specific ligands. The targeting ability of the ligands will then be evaluated by in vivo optical imaging studies using mice models. The discovery of these peptide ligands will prove to be of great potential for pancreatic cancer detection and elimination. The absence of curative therapies for advanced or recurrent forms of metastatic cancer has prompted a vigorous search for novel treatment strategies. Cancer immunotherapy uses the host immune system, either directly or indirectly, to combat cancer. The more successful cancer immunotherapies are antibody-based. In this study we hypothesized that a chemical antibody (chembody) with an intact Fc region can be constructed by conjugating tumor cell specific peptidomimetic agents (ligands) to the Fab region of human IgG (hIgG). The ligand of interest, RGD, has been shown to bind effectively to aßintegrin expressed on tumor cells. The resultant chembody will have the ability to opsonize the tumor cells and elicit host immune response against cancer cells by activating the complement system and recruiting the immune effector cells. In this study, we (1) conjugate naïve hIgG with the ligand, (2) verify ligand conjugation, and (3) test the efficacy of the chembody. The 2-iminothiolane conjugation method was employed to conjugate the ligand to naïve hIgG. The conjugation was verified by performing Western blot analysis, MALDI-MS assay, flow cytometry, and cell binding assay using chembody-coated protein A beads. The Western blot and Coomassie blue staining showed that conjugation was successful while the MALDI-MS assay showed a 1:1 conjugation ratio. Colorimetric cytotoxicity assay will be used to test the efficacy of the chembody. We expect chembodies with intact Fc region to be tumor specific, be able to effectively penetrate tumor and actively recruit immune cells to the tumor site and have low immunogenicity. This novel individualized medicine approach in cancer immunotherapy can be very effective in eliminating the remaining cells responsible for relapse after chemotherapy or radiotherapy. The Center for Biophotonics, Science and Technology (CBST) summer internship was a wonderful experience that I can’t just describe in words. In fact, it was a blast. I would recommend students interested in science and research to be a part of this great program to get the full gist. The invaluable experience I gained working with Dr. Kumar in Dr. Lam Lab was incredible. The mentorship from both Dr. Lam and Dr. Kumar was excellent. They were very informative and were a great resource for me. The members of the lab were also very accommodative and informative. I will forever cherish this summer experience and I consider it a great privilege and an honor to have worked in the lab. More so, the CBST staffs (Dr. Molinaro, Dr. Galosy, Dr. Corbacho, Michelle, and Alisa) were also wonderful and awesome. For the Lam lab interns and the entire 2009 summer interns -- You’re simply the best. As one of the hallmarks of cancer, uncontrolled cell division is characterized by disrupting cell cycle regulation. Chromatin modifications have been shown to play a key role in the transcription of proteins, such as those involved in the cell cycle. Histone methylation and demethylation are among the known epigenetic modifications that can alter gene expression. The newly discovered family of JmjC-domain-containing proteins have been recently identified as histone demethylases. KDM7, a novel histone demethylase which contains the JmjC domain, has been shown to be overexpressed in breast cancer tumor cells. Previous experiments in the lab on KDM7 have revealed that it demethylates the H3K36me2 region of histones, and that KDM7 overexpression increases the transcription of Cyclin A, a cell cycle regulatory protein. To further confirm previous research on KDM7, this experiment tested the effects on Cyclin A levels after using siRNA to knockdown KDM7 in normal breast cells. MCF10A cells were transfected with siRNA targeting KDM7 and immunoblots performed on the whole cell lysates showed a decreased amount of KDM7 and Cyclin A proteins. Immunoblots for H3K36me2 were also performed on histone extractions from the cells, which showed an increase in H3K36 methylation. These results suggest KDM7 and Cyclin A levels are directly related, supporting the hypothesis that KDM7 is involved in Cyclin A transcription. Also, the increased amount of methylation at H3K36 indicates KDM7 is indeed involved in H3K36 demethylation. This study helps set the stage for KDM7 cancer therapy research in the future. As an incoming UC Davis junior from a small community college, I felt I was already far behind my classmates since I had zero real world research experience and minimal knowledge thereof. Little did I know the CBST summer internship program would help set me miles ahead of my classmates. This program is far more than just a summer job in a lab. Packed with professional development workshops and guest speakers from various fields of interest, the agenda for the summer supplies interns with down to earth, relevant skills that can carry on to all professions. My favorite part was the career panel, which featured successful individuals from a very wide range of career paths that the interns were free to inquire about anything from day-to-day lifestyle to advice for rising students. Another huge highlight of the summer was the CBST retreat to Lake Tahoe during which we had the opportunity to listen to researchers present their work, and attend a research poster symposium. My personal experience in the lab was simply invaluable. From day one in the lab I learned hands on modern techniques that involved immunoblot, cell culture, and some DNA work. However, the most memorable part of the internship was the time spent getting to know my fellow interns, many of whom are in the same boat as me. Group activities such as dinner in Sacramento and bowling in Davis were unforgettable events that not only helped expand our professional networks but also to forge new friendships. The glutamate receptor N-methyl-D-aspartate (NMDA) is thought to play a specific role in neuronal plasticity in the mammalian nervous system. NMDA allows the entry of calcium (Ca2+) into the cell which is linked to neuronal plasticity. NMDA is comprised of four subunits: two NR1 subunits and two NR2 subunits (NR2A-2D). Previous in-vivo studies demonstrated that NR2A and 2B are the predominant NR2 subunits in the cortex. NR2B expression is highest early in development and is the most Ca2+ permeable of all NR2 subunits. We hypothesized that, similar to previous in-vivo data, there will be a developmental shift from NR2B to NR2A containing receptors as the cells age in culture. This shift should result in a decrease in Ca2+ entry into the cell following either glutamate stimulation (10, 100 and 1000 -M) or mechanical injury as cells age from 2 to 7 days in-vitro. Contrary to our hypothesis we observed greater calcium entry in the older cells in response to both injury and stimulation. We feel that this does not reflect the NR2A/NR2B ratio and is more likely to do with a total increase in NMDA expression. Future studies will utilize the NMDA receptor antagonist AP5 and the NR2B antagonist ifenprodil to determine the relative contribution of NMDA overall and NR2B containing subunits specifically to calcium entry following neuronal activation and injury. Once we finish this basic characterization we hope to determine how injury affects long-term changes in NMDA receptor expression and the potential impact of injury on neuronal plasticity. Caenorhabditis elegans are transparent roundworms (nematode) about 1 mm in length used in molecular and cell biology. It is used as a model to understand nuclei migration because its cheaper to breed, can be frozen and works well when thawed, its genome is known, and different mutants can be bought to study nuclear migration of hya7 cells in those mutants. e1408, km11, RB1022, and wild type C. elegans are used in this experiment where hyp7 nuclei migration is recorded and compared to show any phenotypic differences among the four. UNC-83 protein (found on ONM) and UNC-84 protein (found INM) are theorized to be responsible for moving the nucleus cross the cytoplasm. These proteins are manipulated in these worms and using Leica DM 6000 compound microscope these differences were clearly seen. In wild type C. elegans the nuclei moved towards the center and once aligned moved across the cytoplasm. In e1408, the nuclei did not move once they were aligned. Why study nuclear migration? Lissencephaly (smooth brain) is a disease of brain malformation (lack of folds in the brain). One known cause is defect in neuronal migration where neural cells do not move from place of origin to final location, failure in nuclei migration in neural cells. Most children with the disease die before age of 2 due to respiratory problems and no significant development is seen beyond age 3 to 5. Bowling, playing tennis, eating tons of food, hiking, working on research projects, and just having a blast, is just a taste of what was experienced this summer. Being with a group of people who can brighten your day with just their smiles and working with the PI and the mentors as well as getting hands on experience is something I looked forward to everyday. At times it may feel like you’re lost or not understand a single thing you are being explained, but the more questions you ask the more you will expand your mind. Spending time with the interns and getting to know each other makes you feel close like a family. A family you can count on for any kind of support and just having someone to talk to. The research experience and learning about all the other projects is an adventure I will never forget. The project itself is like a roller coaster ride with its ups and downs with how the experiment works or doesn’t work, trying to find any new idea and repeating things until you are an expert at it. This opportunity I will seize any day, hour, or minute because you not only learn about the science but also learn about yourself and your limits. I would recommend this experience to anyone I meet because you come out as different person with greater knowledge, expertise, and more confidence. A variety of biological samples can be imaged by the Till iMIC microscope under environments that range from fixed cell arrangements to microfluidic chambers. Generally imaging is pursued to observe structural features of the sample and to capture Raman spectra through WinSpec software. The current process requires the user to position the excitation laser on a certain cell feature of interest and focus the z objective to obtain the most precise Raman spectra, but this is usually a cumbersome process. To facilitate Raman imaging, automated image analysis routines, a unified user interface through MATLAB for controlling the microscope and its components, and automated communication with WinSpec via puppet commands are being developed. Polystyrene beads were used to calibrate the live acquisition camera to the imaging field as we obtain the pixel to millimeter relationship, allowing point and click manipulation of XY stage. A function was added allowing the user to define particular locations, which are stored into a list box and can later be recalled. The beads were used to develop an algorithm that automatically extracts the mean intensity of the laplacian value. This information allows analysis of the focus, which can be implemented into an auto focusing function where the mean intensity value is maximized at the optimum focus position. Future goals in this project include automatic cell boundary definition and cell identification as well as a Raman imaging feature, which will display Raman spectra for each pixel of the image to truly automate the Raman spectra acquisition process. The summer internship at CBST was an invaluable experience to me as it not only allowed me to expand my academic knowledge and apply it to practical use, but it was also supplemented with other activities that were incredibly educational and helpful. Dr. Ana Corbacho coordinated the first week intensive program, which allowed us to get comfortable and make friends with the other interns as well as prepared us to be productive in the laboratory setting. Working in the laboratory helped me to become more independent and improved my abilities to work together with the other post-docs, grad students, and other interns who shared the same workspace. The 3-day retreat at Squaw Valley featured several keynote speakers addressing biophotonics and was a very relaxing and memorable trip that I felt very lucky to be a part of. The workshops were very helpful and gave us insight about various career directions we could take, whether it be industry, grad school, med school, or something else as well as prepared us to be able to deliver professional and effective presentations. Overall, this was an amazing opportunity for me and I would absolutely recommend other undergraduates to experience the exciting and rewarding benefits of this internship program. Na+/K+-ATPases play a crucial role in many different functions of living cells, such as maintaining a stable resting membrane potential. Upon application of the synchronization modulation method, the cell is exposed to an oscillating electric field, which first synchronizes the turnover rates of the Na-K ATPases in the cell, and then modulates the ATPases to higher pumping rates. Using this method, it has been experimentally shown that the membrane potential of frog skeletal muscle can be hyperpolarized under physiological conditions. We conducted a series of experiments that show that the synchronization modulation method can also hyperpolarize the membrane potential in non-excitable cells under physiological conditions, using Xenopus laevis oocytes. The voltage clamp technique was used to measure the resting membrane potential of oocytes, which ranged from -24 mV to -48 mV. After this, a 6V synchronization modulation pulse train was applied for two minutes. The membrane potential of the oocytes was hyperpolarized, with an average decrease of 6 mV. To verify that the phenomenon was indeed due to the effects of the Na+/K+-ATPase, 1mM ouabain, an ATPase inhibitor was added to the oocyte solution, and the oocyte stimulated again at 6V for two minutes. The result was no significant hyperpolarization. We repeated the experiment with an 8V synchronization modulation pulse train. The hyperpolarization was greater, with an average decrease of 11.25 mV. With the addition of 1 mM ouabain, no significant hyperpolarization was observed. Our results show that the synchronization modulation method can hyperpolarize the membrane potential of non-excitable cells. This summer, I was very fortunate to participate again in the CBST summer internship. I had very much enjoyed the internship I had done last year, and this year was just as enjoyable. For the first week, all the interns attended a first week intensive, where we participated in many activities that made us think about science and the world and facilitated the formation of friendships with other interns. I really enjoyed the activities and especially getting to know my wonderful fellow interns. After the first week, we each started work in our respective labs. I had the good luck of being able to return to Dr. Min Zhao’s lab this year. In the lab, I was able to continue with the experiments that I’d started this winter. Dr. Zhao and all the people in the lab were really friendly, helpful, supportive, and knowledgeable. Around the middle of the internship, all the interns went to Lake Tahoe to participate in the CBST annual retreat. There, we were able to listen to many interesting presentations and network with scientists from around the country. There was also the enjoyment of much good food and beautiful scenery! The CBST internship this year was wonderful as usual. I learned much about science and made many friends. I would definitely encourage interested students to apply, as this was a truly great experience. I would like to thank Dr. Ana Corbacho and CBST, Dr. Min Zhao, and my fellow interns for making this an unforgettable experience! Lopez A., Torres J.V., Ph.D and Marquez J.P., M.D. Breast cancer is the most common form of cancer in women of all ethnicities and the number one cause of cancer death in Hispanic women. Breast cancer accounts for 22% of all cancers diagnosed in women, worldwide, with incidence rates increasing considerably. Current detection techniques, such as screening mammography, are not very sensitive and can give false positives. Therefore, the ultimate goal of our study is to identify potentially immune biomarkers that can accurately diagnose the onset of breast cancer and can be used as early detection and potentially early chemoprevention intervention of pre-malignant and early carcinogenesis events. 125 samples of advanced breast cancer patient relatives and 45 samples of advanced breast cancer patients were analyzed as part of this study. We used Enzyme-Linked Immuno-absorbent Spot assay (ELISPOT) as a reliable assay for the detection of T-cell responses in this clinical cohort. As noted in recent reports, Survivin, EGFR and BCL-2 proteins can serve as potential biomarkers for early breast cancer detection. These three proteins are well known as Tumor-Associated Antigens (TAAs) and have shown good immunogenicity in several cancers including breast, both for diagnostic and therapeutic purposes. Thus through the detection of the naturally occurring immune response we may be able to detect and perhaps prevent breast cancer. Understanding the immune response to these cancer antigens, we hope to be able to use this natural immune biosensor as a promising biomarker approach in breast cancer and perhaps other human cancers. My summer as a CBST intern was extraordinary. The first week of the internship was, in my opinion, very significant and imperative for my learning experience. The team building activities were much fun; these activities also allowed us to create and build long lasting friendships with the other interns. Having students from different universities, different backgrounds, and realities brought a great deal of diversity and culture. The CBST retreat was so much fun. That was the first time I was in Tahoe and it was beautiful. Moreover, I had the opportunity to meet and network with other students that were also conducting research; I was also able to interact with doctors that gave me tips and great advice. Above all, I believe this program excels in preparing students to become future scientists, not simply because of the exposure to the real laboratory setting and the preparation for one, but because as an ethnic-minority student I was able to connect and relate with my principle and co-principle investigators, as well as the rest of the lab colleagues where I learned concepts about immunology and cancer research, a topic I became very interested in. Furthermore, I learned lab techniques that I will be able to apply in the future. I am very much grateful with Dra. Corbacho for allowing me to form part of this summer internship and to the CBST staff for organizing and making this experience possible. It is well known that androgen-dependant prostate cancer cells (LNCaP) undergo neuroendocrine differentiation in response to certain stimuli, such as IL-6 and androgen withdrawal. Recently, it was found that LNCaP cells also undergo autophagy in response to IL-6, prior to neuroendocrine differentiation. Autophagy is the process of self-eating in which cells degrade and recycle proteins and organelles during metabolic stress in order to survive. This suggests that IL-6 induced neuroendocrine differentiation in LNCaP cells is a stress response, perhaps as a result of the autophagic process. We therefore investigated the relationship between autophagy and neuroendocrine differentiation in LNCaP cells. First we confirmed activation of autophagy and upregulation of neuroendocrine genes by western blot analysis. We quantitated the amount of autophagy in response to various concentrations of IL-6 and serum by fluorescent microcopy, utilizing fluorescently tagged LC3 protein. During autophagy, LC3 is cleaved from LC3-I to LC3-II and then reorganized into autophagosomes, which can be seen visually as punctae in the cell. Next we knocked down autophagy genes, such as Beclin and Atg7, to determine the effect on neuroendocrine differentiation. A number of cells showed significant modification with many cells dead. This shows that autophagy is a necessary element in neuroendocrine differentiation in LNCaP cells which potentially can be manipulated to prevent the accumulation of treatment-resistant neuroendocrine prostate cells. 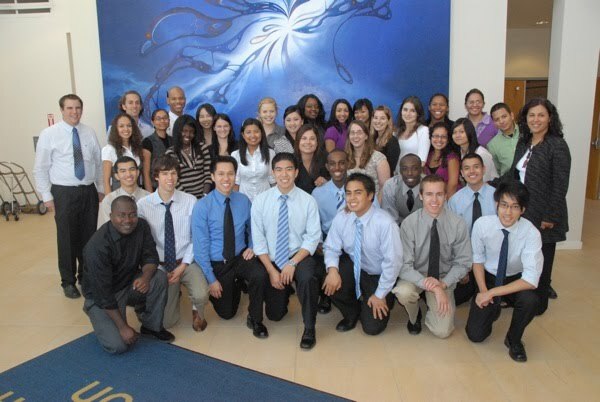 The 2009 ET-CURE/CBST Summer Internship has been an incredible experience. I have been working in Dr. Hsing-Jien Kung’s lab and I could not have asked for a better placement. Everyone in the lab is helpful and extremely nice, and my secondary mentor, Dr. Sonal Desai, is as inspiring as she is intelligent. She has shown me everything from cell culturing to Western Blots to luminescent staining. We have been working on several projects including using 3-D culturing of LNCaP cells to further mimic the microenvironment of prostate cancer. There are also other aspects of the program that make it so appealing. There is a journal club that meets up once a week where we learn how to dissect a scientific publication, and we have other meetings with topics such as how to write a personal statement and how to act and dress for an interview. The most illuminating activity was a retreat that took place in Tahoe. Researchers from several fields presented their ground-breaking work, and I was bombarded by many researchers that I could use as an example to compare myself to. There were poster presentations where I could even approach these renowned individuals. I felt like I could be meeting with my future self. Furthermore, the social interaction with my lab partners, from the wise Dr. Kung, the compassionate Dr. Dasai, the brusque Dr. Martinez, and my fellow undergraduate, Steve Huerta, has shown me that teamwork is essential in order to become successful; you cannot do it alone. Current cancer radiation treatment has its shortcomings, such as low selectivity for cancer cells alone, loss of healthy cells, and danger of unaffected cancer cells multiplying without competition. Nanoparticle-Enhanced X-Ray Therapy (NEXT) is using gold nanoparticles to create a radiation treatment that will target all cancer cells only, solving two major problems of current radiation treatment. We will use Cryo-EM to visualize the structure of plasmid supercoiled DNA with nanoparticles attached before and after X-ray radiation. We expect that after radiation, plasmid DNA may be damaged extensively. Gold nanoparticles bind to DNA through the use of eithidium-thiol ligand. Synthesis of this ligand involved the reaction of a primary alcohol with triflouromethanesulfonic anhydride to produce an alkyl triflate, which is then reacted with a phenylphenathridine, followed by hydrobromic acid; the product is ethidium bromide with a thiol ligand. The reaction of the ethoxythiol gold nanoparticle with synthesized ethidium-thiol will produce gold nanoparticles with ethidium at the end of the thiol-alkyl chain. This will connect the gold nanoparticles to DNA, and X-Ray radiation will be administered. Cryo-EM will show the extent of damage to the DNA after radiation. Afterwards, plasmid DNA with nanoparticles attached will be administered to cancer cells; once the plasmid DNA is taken up by the nucleus, radiation will be applied, and cancer cell’s DNA will be broken. This treatment is subject to much research and testing still, but once it’s complete, will be a very effective way to eliminate all cancer cells. This summer I participated in the CBST Undergraduate Summer Internship- it was one of the most worthwhile things I’ve ever done. I was in a group of very diverse people; we learned so much from each other, became good friends, and had A LOT of fun! The learning experience was absolutely priceless. Never before have I had the chance to immerse myself so deeply into the research project- it definitely taught me to work independently and think creatively to solve problems. I worked under the supervision of Dr. Ting Guo, my primary mentor, who was kind, helpful and really cared about my learning. Zane, my secondary mentor, was also very helpful, and Matt and Joyce made the whole experience enjoyable. Not only have I learned much in the lab, I really enjoyed my time there because of the great people involved. It was great to see my project move forward as we made progress and planned our next steps. Dr. Ana Corbacho and others at CBST engaged us in great activities that developed our teamwork and problem solving skills; we learned valuable lessons about preparing for interviews, developing presentations, and much, much more. The retreat at Lake Tahoe was the highlight of my summer- an unforgettable experience filled with learning and lots of fun. Overall, my summer couldn’t have been spent better, and I am very grateful to Dr. Ana and others involved for giving me the opportunity to grow as a researcher and a person this summer! The aßintegrin, or vitronectin receptor, expressed on the surface of various normal and cancer cell types, is involved in numerous physiological processes such as angiogenesis, apoptosis and bone resorption. Since the integrin plays a key role in the angiogenesis and metastasis of human tumors, aßintegrin ligands are expected to have potential value in targeted therapy and imaging of cancer. We have used aßintegrin transfected K562 cells as probe to screen one-bead one-compound (OBOC) combinatorial libraries containing RGD motif and identified cyclic peptide LXW7 as a leading ligand that bind specifically to aßwith high affinity (kd= 76±10 nM). Here, a series of analogs of LXW7 were designed and synthesized in solution phase. With the use of a competitive assay through Flow Cytometry analysis, we are testing the half inhibition concentration (IC50) of the peptide analogs to identify ligands with higher affinity than LXW7. Further targeting characteristics of the potential peptide analogs will be evaluated in vivo in xenograft mouse model with optical imaging. The ET CURE and CBST programs have continued to exceed my expectations when it comes to the administration, staff, interns, and labs. This is my third summer and I am finding that I am still learning new things everyday. This experience allowed me to expand my skills as a young researcher and I have really grown professionally. Networking is becoming something I get more and more excited to pursue and with it many new opportunities have opened for me through this program. My lab continues to give me confidence to work independently and take on new responsibilities. I was able to apply what I know from my background in the sciences and build on it at the same time. It has shown me what I am capable of and the potential impact I can make in my future. The courses, seminars, and group activities have changed the way I approach challenges in the sciences and in daily life. I owe this to all the people involved with CBST. Through these experiences long lasting and special friendships were formed. I don’t think I have had a more exciting time working so hard. All of this gives me a feeling of accomplishment and I would never trade my experiences with these programs. I hope every student gets an opportunity to be involved with programs like these that are truly unique, challenging, exciting, and rewarding. Cells tend to acidify their environment as a function of normal cell metabolism. Cells that experience ligand-mediated activation can acidify their environment up to 3000 times more than cells without ligand-mediated events. Therefore, cellular activation can be monitored as a function of pH. Currently, bulk measurements of cellular pH and fluorescent dyes are used to monitor cellular pH as a function of external stimuli. The primary goal of this project is to expand the initial work of Talley and Huser, who developed a pH-sensitive, Raman-active nanoprobe utilizing surface-enhanced Raman spectroscopy (SERS). By binding 4-Mercaptobenzoic acid (4-MBA) to silver and gold nanoparticles, they were able to enhance the pH-sensitive vibrations of 4-MBA, and overcome naturally occurring auto fluorescence in vivo. However, in their work, they found that the SERS enhancement was largely uncontrolled and greatest at the junction of two or more nanoparticles. Thus, we developed 3, 7 dimercapto-2-naphtoic acid, a pH-sensitive molecule that is capable of actively linking two nanoparticles and connects them in their junction. The gold and silver nanoparticles were synthesized via the well-known Lee and Meisel procedure and had a plasmon resonance at 535nm and 405 nm respectively. We used Atomic Force Microscopy (AFM) to determine the size of the Au nanoparticles, and the average diameter of the particles was 79 nm. The linker molecule was synthesized via a four-step synthesis following an approach by Otto. The reactions were monitored via thin-layer liquid chromatography. I had a unique opportunity to get involved with both the Winter Internship and Summer Internship at Center for Biophotonics Science and Technology (CBST). The relaxed learning environment made it easy for me to meet many fine friends from both internships. I enjoyed the games during First Week Intensive because they allowed fellow interns and me an opportunity to get to know each other well before we were divided into labs in the second week. I especially enjoyed the CBST Annual Retreat at Squaw Creek Resort because we had so much fun together while we learned from each of the presentations. I would like to thank to Dr. Ana Corbacho and Dr. Marco Molinaro for organizing many of these fun informative activities. I also attended both CBST’s and Dr. Gene Gurkoff’s journal clubs, and presented an article in Gene’s journal club. This helped me hone my presentation skills while simultaneously showing me how to extract pertinent information from different journal articles. I also would like to thank to my secondary mentor, Latevi Lawson, who was very helpful and supportive. By participating in this summer research project, I learned new lab techniques that will further my career advancement. Finally, I would like to thank to National Science Foundation, UC Davis and CBST for making this undergraduate research internship possible. Many neurodegenerative diseases such as Alzheimer’s disease are caused by protein aggregation. Aggregation is favored by certain protein configurations, in particular by those characterized with protein misfolding. In this study, Raman spectroscopy was utilized to investigate protein aggregation and the role of water in the aggregation process. Bovine Serum Albumin (BSA) was used as a model protein, since it is an easily available and well characterized protein. BSA samples were prepared in Phosphate Buffer Saline (PBS) or Hyclone water at different concentrations, and Raman spectra were recorded using a 785nm laser excitation and a cooled CCD camera attached to an Acton spectrometer. In order to better evaluate the aggregation process, Raman spectra were also measured when the sample was prepared using the Drop Coating Deposition Raman (DCDR) method. DCDR is a technique that makes use of the tendency of the solute to deposit in the rim of the ring formed upon drying of the sample. The Raman spectra of the protein solutions and dried samples show significant changes in the high wavenumber region (between 2,700 and 3,500 cm-1), which may reflect changes in the protein conformation. These results will provide useful information regarding the possibility of using Raman spectroscopy for the detection of protein aggregation. Science has always intrigued me, dating back to high school. I excelled in physics, chemistry, math, and biology. It was apparent to me from my first year of high school that I would like to pursue a career in engineering. At the time, my goal was to go into civil engineering. Then the summer before my senior year of high school, I attended Engineering State at Utah State University and discovered bioengineering. I am currently pursuing bioengineering at the University of Utah. After I finish my undergraduate degree at the University of Utah, my interest in graduate school is split between continuing bioengineering and pursuing a dental degree. I hope that this internship will enable me to expand in several areas including allowing me to increase my knowledge in the field of bioengineering and science overall. I also would like to discover how far I want to go with bioengineering. I hope to use this internship to improve my resume for another research group and facilitate getting accepted into one. For my bioengineering major, during my senior year this internship research would to apply toward the class BME Project I and Project II. My goal has always been to go into a career that would better the quality of life, mainly in the medical field. My problem, however, was the profession of being a medical doctor did not appeal to me. When I discovered bioengineering at Engineering State, I discovered a career I could pursue that would meet my goal of enhancing my knowledge and quality of life, in the medical field. Bioengineering also has many different aspects to it, from drug delivery systems to imaging to artificial organs, such as an insulin pump in diabetes, MRI, and the artificial heart, respectively. The primary project that I chose was, Ultrasensitive Sers-Based Protein Binding Assays, which caught my eye because of the protein, assay. In my high school class, Biotechnology, we performed Bradford Protein Assay using Coomassie Blue dye. Fascinated, I found out that Sers-Based Protein Binding Assays are being researched because they would allow for quicker disease recognition by detecting lower concentrations of the disease. The second project that is most interesting to me is Immunohistochemical Analysis of Gut Tissue from Individuals with Human Immunodeficiency Virus Type 1 and Inflammatory Bowl Disease. In cell biology, we briefly touched on the subject of IHC staining. I would like to learn more on the subject and even research it. Finally, the last project I thought would be exciting to work on is the Development of Novel Drug Delivery System for Cancer. After my dad had cancer in 2005, I have wanted to make a difference in preventing and add to the knowledge of cancer. All of these topics seem interesting, and would enjoy working on any of them. While I do not have any work experiences within research or the science field, I have experience in a lab. In high school, I enrolled in a biotechnology class and was the teacher aide the following year. Throughout the two years within biotechnology, I developed various lab techniques. Performing the labs that we did, I found it fun to work in this field and ultimately sparked my interest in performing research. Effects of cryopreservation on the integrity of biological samples is a great concern for researchers. In spite of numerous approaches to reduce artifacts, freezing still results in some structural changes in the preserved samples. The dehydration and rehydration of the samples are mainly responsible for these undesired outcomes. These affect might increase the fluorescence and/or the lifetime of the samples. To determine if these structural changes affect fluorescence spectra of preserved tissues, 2 fresh porcine aortas were obtained and autofluorescence was measured at 10 locations in 3 tissue states: fresh, frozen, and thawed. The freezing process involved the tissue being dipped in isopentane then liquid nitrogen (flash freezing) and stored at -80oC. The same set of fluorescence measurements were collected from the frozen and the thawed samples (same locations). Intensity and lifetime information obtained from the samples was compared. Increasing in lifetime was observed as comparing the fresh, thawed and frozen state of the same sample (with a noticeable increase in the frozen tissue,1.5ns to 2.5 ns longer than the fresh sample ). The intensity spectrum maintained their shapes in all three states of the samples although small shifts in the intensity were observed such as 10 to 35 degree higher than the frozen sample and 5 to 25 degrees higher than the thawed sample). However, no significant change was observed from the normalized intensity spectra. The data collected proved the hypothesis to be false. Freezing will increase the lifetime of biological sample while decrease the their intensity. Toward the end of CBST internship my life has turned to a new page. Receiving the acceptance email from Ana, I was filled with the excitement for my very first laboratory internship. After the first week, I was amazed by all of the interesting discoveries I made about other interns and myself. The weekly meetings and the retreat has drawn me closer to CBST family and the scientific community. For such a long time, I have been trying so hard to build a wall to cover the boredom and the weakness that I possessed. Mingling with all of CBST interns, I learned how to start a conversation, how to swim (not quite yet, but it’s a promising start),how to take pictures, etc…Seven weeks in the lab taught me to be patient, to work collaboratedly with others and to take initiation in solving problems. It has been a precious experience that I have had. Spending my summer reading articles and actually conducting the experiment by myself under the guidance of my mentors, I was exposed to the dynamic environment of the research and academia which gave me more insights in my future options. Yes, it was a busy summer that I had, but every minute worths its while. Immunotherapy, when referring to cancer, most often refers to a strategy of enhancing the immune activity to combat the cancer. Most clinical diagnoses of cancer are found highly disseminated, and prove to be extremely difficult to locate and treat, the immune system offers a possible solution to this problem. In our lab, we use an immunotherapy regimen comprised of an antibody and a cytokine to stimulate immune system activity directed at tumors in mice. The specific combination used in our lab is recombinant human interleukin-2 (rhIL-2) and an agonistic antibody to CD40 (aCD40). rhIL-2 is a cytokine that expands lymphocyte populations, particularly T cell and natural killer cells, and is a Federal Drug Administration-approved therapy for advanced metastatic forms of cancer in the kidneys and of the skin. Combination therapy between rhIL-2 and aCD40 has been shown to cause significant, non-specific immune system activation and expansion leading to clearance of tumors. However, during therapy, animals exhibit clinical symptoms of toxicity, including weight loss, ruffled fur, hunching, decreased activity levels, and enlarged liver and spleen at necropsy. To further investigate toxicity involved in therapy, we looked at leukocyte populations in the spleen, tissue pathology in the liver, lungs, and the gut, and we also performed serum cytokine analysis for proinflammatory cytokines If immunotherapy is to be adopted as a treatment option for metastatic forms of cancer, it is crucial to find the ideal dosage to achieve anti-tumor responses but avoid autoimmunity in healthy tissues. We have preliminary data suggesting that blocking key inflammatory cytokines may alleviate the toxicity yet still result in anti-tumor effects. I believe that growth as a student has to come in other forms other than in the form of the traditional classroom education. Diversity is needed to help us explore parts of ourselves previously unknown; this program has been one such source of diversity. I have been introduced to so many individuals who have helped shape and expand my own paradigm, and have left me much to reminisce on. This is the second summer that I have been fortunate enough to be a part of CBST’s undergraduate summer internship program and I feel that there are bottomless depths to the knowledge and life lessons I have learned and continue to learn daily. It has been difficult at times trying to wrap my head around advance concepts and at times having to face areas where I feel fell short of success, but as I great confidant of mine told me once, “a setback, is just a set up, for a comeback!”, and each such setback motivates me and pushes me forward. I can’t tell you today that I have answered all my answers being part of this amazing program, but I can tell you that each experience reveals a piece of myself I never was able to explore in the past, and a better idea of what may just be best for me in this world. I just want to thank all the amazing interns for being there and being wonderful friends, the CBST staff is awesome I couldn’t have imagined any better, and finally everybody in Murphy lab for your patience and guidance. Early detection and diagnosis of atherosclerosis, leading cause of death in the United States, depends on the availability of tools to characterize plaque morphology and composition. A novel combined Time Resolved Laser Induced Fluorescence Spectroscopy (TR-LIFS), Ultrasound Backscatter Microscopy (UBM), and Photo Acoustic Imaging (PAI), was developed in our group. Two phantoms were built with optical and acoustical properties of biological tissues to test and validate the system. The first phantom consisted of 4 tungsten wires each with a 13µm diameter, and was used to test the imaging resolution of the UBM and PAI system. The UBM system used a 45MHz transducer, with a 3mm focal depth and a 3mm aperture. The mean axial distance was 1143.33µm +/-32.14µm, while the average lateral distance was 690µm +/-29µm. These measurements are within range of the initial distances of the wires. The -6dB lateral and axial resolution were found to be 65µm and 50µm respectively. The second phantom is a cylindrical phantom, 25mm long, with a 5mm lumen and a 3mm incision filled with graphite 0.08% graphite particle <20microns diameter; built out of 8% polyvinyl alcohol and 0.4% silica by weight. This phantom will be used to test such a combined system with an intravascular catheter based platform which would incorporate the use of ilab Ultrasound Imaging system. “Shining Light on Life”, this experience was nothing short of extraordinary. I was especially surprised by the interdisciplinary nature of information I went through this summer. My mentor Dr. Yang even taught me how to say “hi” and “good bye” in Chinese. Merging different disciplines seems not only to embellish the papers I read, but empowers the researchers to think across the spectrum (no pun intended) where the solutions reside in different fields. A theme reflected in my own research project this summer. More so, I learned how the right application of the properties of light can make an intense lifetime of difference (pun intended) in so many different areas of medicine… even in these so called “incurable diseases” section. My lab emphasizes a matter-of-fact prevention and diagnosis approach to tackle atherosclerosis, perhaps capable of eradicating such condition altogether. It was an honor working for Dr. Marcu. The friendliness of everyone in the lab complemented my insightful journey in Biophotonics, providing everything from lasers, to humor, to technical and life advice. I had the chance to meet and bond with amazing interns, all of us trying to figure out the next step in our lives. This summer has only reinforced my desire to serve my community both directly and through research as a medical scientist. Many thanks to Dr. Ana Corbacho and the staff of CBST. Melamine was introduced to baby formula in China to make the milk appear to have more protein because the protein content is measured by the nitrogen content. Melamine contains sixty-six percent nitrogen; therefore making the formula appear to have more protein. Being able to detect melamine in food products is important because trace amounts can cause kidney and renal failure if consumed, especially in infants. Melamine has a unique Raman signature that can be enhanced through the use of surface enhanced Raman spectroscopy (SERS) using silver nanoparticles. Silver nanoparticles functionalized with mercaptopropioninc acid may enhance the signal due to the electrostatic interaction between the carboxylic groups of the acid and the amino groups of the melamine. The limit of detection is currently being determined to see if this is a viable method to use to meet FDA standards of 1 ppm of melamine in baby formula and 2 ppm for other foods. This summer internship has been one of the most exciting and educational experiences I have had. It was the first time I have ever had any lab experience outside of the chem lab at school and I have learned a lot. I have learned a lot about lab protocol and the instruments I was working with. Cynthia, my primary mentor, was very helpful and patient with me. Also, Sebastian, who was my PI, was also very helpful and asked a lot of questions to make sure I knew what I was doing. The seminars with the interns were also very good. We learned about how to write well written resumes and got some good interview tips. Also, the retreat was a really good way to see how the scientific community works together and network with other researchers from other areas. It was also interesting to learn about some of the other research that people are doing all over the place. Again, I had a great summer and don’t even know how to begin thanking everyone who made this internship possible. The screening of one-bead-one-compound (OBOC) combinatorial chemistry libraries against a single target protein and the screening of phage display libraries against a single ligand or target protein has both been well developed. Recently, a novel multiplex screening method has been developed to screen an OBOC small molecule library against a phage display cDNA expression library to discover protein-small molecule binding pairs efficiently. The structures of the small molecules have been decoded and each identified compound has been re-synthesized on tentagel beads in large quantities for the convenience of biopanning. We used beads displaying the small molecules to pan the T7 phage-display liver cancer cDNA expression library. After thorough washing, the bound phages were eluted and amplified by infecting E. coli BLT-5403. Four rounds of phage panning and amplification were performed for each ligand to enrich the phage populations which display proteins that bind to the ligand specifically. At the last cycle of amplication, single plaques from T7 infected E. coli were isolated and polymerase chain reaction (PCR) amplification for DNA sequencing performed. Based on the DNA sequence, protein BLAST was performed to identify the putative target proteins. The protein-small molecule binding pair database has been established. Some of these small molecules may have anticancer activitiy. Others may be useful as capturing agents for the development of novel diagnostic or proteomic tools for liver cancer. Being part of the Emerging Technologies Continuing Umbrella of Research Experience (ET-CURE) program at CBST this summer has strongly motivated and engaged me to think in non traditional ways. My primary mentor Dr. Kit S. Lam and secondary mentor Chun-Yi Wu have helped me understand problems that were once thought to be too complex can be better approached by integrating knowledge of various disciplines. Diversity and collaboration of disciplines were key themes in this lab. Everyone in the lab was extremely helpful and made me feel very welcome. Dr. Lam’s attention to the lab and the interns surpassed my expectations. The experience I acquired this summer has been extremely helpful in many aspects. The first week intensive really helped me get to know the other interns and the activities like journal club, workshops and retreat in Lake Tahoe have reinforced a better understanding of how important research is to the community. I was very fortunate to be in a program with caring individuals whose goal is to see the interns be successful. Ana Corbacho has been a tremendous inspiration to me and continues to impress me with her dedication to the interns. The persistence of the CBST staff to assist the interns be successful has left me with much gratitude and appreciation. Thanks to Dr. Lam and his lab, the CBST staff, UC Davis and all the interns, this summer has been one of the most beneficial experiences in my life. Platinum (Pt)-based therapeutics, such as carboplatin, can effectively treat many solid tumors, but the majority of patients are not cured, and instead suffer potentially lethal side effects. There is currently an unmet medical need for predicting which patients will respond to the chemotherapy. Accelerator Mass Spectrometry (AMS) is an ultrasensitive method of detecting rare isotopes such as 14C in biological samples. AMS has proven to be a powerful tool in detecting drug-DNA damage, called adducts, formed between [14C]carboplatin molecules and nucleobases of treated DNA, which are known to cause cell death during chemotherapy. If the drug-DNA damage can be measured in patients, then tumor responses to therapy can be predicted. Since the [14C]carboplatin is radioactive, it will be difficult for physicians to accept the dosing of patients with the compound, regardless of the diagnostic value. So to limit patient exposure to radioactivity, we are developing a method to “postlabel” DNA treated with nonradioactive carboplatin using a 14C-labeled chemical that reacts with metals. A candidate “postlabeling” chemical was purchased from a commercial supplier, reacted with platinated DNA, and the resulting 14C-labeled DNA was measured by AMS. The results will be compared to AMS data from DNA that was reacted with [14C]carboplatin as a positive control. The results of this experiment will be a starting point for the optimization of postlabeling protocols for clinical research applications. Elevated intraocular pressure (IOP) is primarily caused by an increase in resistance for aqueous humour flowing from the eye and is the only known cause of glaucoma. Aqueous Humour and IOP are subject to fluctuation from daily circadian rhythms and cardiac cycles. Due to the dynamic nature of IOP, 24 hour pressure monitoring solutions are necessary to adequately monitor and treat patients in addition to drug therapy and surgery. We set out to engineer an in-vitro test platform that simulates the flow of aqueous humour through the trabecular network of the eye and also maintains a clinically relevant pressure across the cornea interface. The pressure is regulated by the infusion or withdrawal of glycerol via syringe pump and measured by a wet/wet interface differential pressure transducer. The trabecular network of the eye is analogous to a resistor in a circuit model and can be replicated in a microfluidic network. With the introduction of an alternative to the limited supply of enucleated eyes, we have demonstrated an adjustable biomechanical eye model to characterize future sensors for ocular biomechanics. Working with CBST as a summer intern has been a positive and eye-opening experience on so many levels. The first week intensive can be described as a team building boot camp. Halfway through the week, you already feel like you have known your fellow interns for months! Through the career panels and retreat to Tahoe, you are also exposed to a group of fun and interdisciplinary mentors that are more than happy to share their thoughts and experiences about academia, medicine and life in general. Talking to people who have already been through what you are doing gave me a new perspective on how prioritize my goals further down the line. Looking back at the past 2 months, I can't help but be thoroughly impressed by the level of passion that Dr. Ana Corbacho and the rest of the educational program coordinators invest into the myriad of educational programs offered by CBST. Judging from what I have heard from previous interns, CBST continues to make their summer internship program a productive and rewarding experience and one I would encourage everyone to apply to. This work demonstrates the effectiveness of the implementation of 3D Iterative Watershed Segmentation (IWS) into a program with existing 2D Iterative Watershed Segmentation. Iterative Watershed Segmentation is a hybrid of the Watershed Segmentation algorithm and the Gradient Vector Flow algorithm. It is a semi-automatic method that allows for the segmentation of a hepatic tumor using user selected markers. These markers are interactively placed on tumor-containing slices in a volume set of CT scans saved in an industry standard format. Different outlines of the tumor are then calculated by the program and the user selects the best match to determine the final tumor volume. The overall purpose of this program is to test the efficiency of a cancer therapy drug by tracking the volume of the cancerous tumor over a period of time during which it is being treated. The main advantage of using 3D IWS over manual outlines is that the tumor outlines, and thus, the tumor volumes, are minimally user-dependent. Current results also show that using the 3D IWS, when compared to the 2D version, can potentially decrease the user’s time spent in setting the markers, although calculation time increases. Previous works have determined that 3D IWS tends to be slightly less accurate than 2D IWS but still within range of the manual outlines produced by physicians. My summer internship at CBST has been a great experience. I was very fortunate to have been accepted as a summer intern in Dr. Badawi’s lab. I got to work on an interesting field that was completely new to me and I had a great time while working on the lab. My mentors were very supportive and willing to help me in any problem or answer any questions. This internship has opened my eyes to new fields, especially in cancer research and has provided me with great opportunities to get ahead in science that I’ve been extremely lucky to have. The knowledge that I gained while being an intern this summer is invaluable. Through this internship I have learned so many important things on many different levels. I have acquired knowledge of things far beyond what they may teach you in the lab. Perhaps it is better to call it wisdom, as this internship forced me out of my environment and presented me challenges in which I am a better man for having sufficiently overcome. The program was very well structured in that I learned about both the science side of research as well as the human side. The program sought to develop camaraderie among the interns something of which I came to cherish as we all developed into true undergraduate researchers. I worked in the lab of Dr. Rob Berman at med neurosciences in Davis. Dr. Berman and Ryan Hunsaker, my secondary mentor, helped me all along the way to where eventually, I was working independently. Ryan was very enthusiastic in guiding me along through all the procedures and gave me advice relating to the many aspects of research. Outside of the lab, I was able to develop a more professional attitude especially at the annual retreat where all the interns got the opportunity to interact with many top scientists. Besides all that I have accomplished this summer, the knowledge I have acquired is the most important result of this internship and I am truly grateful to the CBST staff for giving me the opportunity to participate. This experience has been enriching, and I walk away with more confidence as a researcher. It has been a valuable opportunity to work so closely with my mentors, and I am thankful for their support and guidance. The weekly seminars were an excellent supplement to daily labwork, and touched on many relevant topics for navigating career paths. I have also enjoyed working with such a diverse and engaging group of interns. The annual CBST retreat exposed me to cutting-edge, ongoing research projects, and highlighted successful collaborations across disciplines from medicine, engineering, and basic science. CBST also served as an arena to meet people who are at different places in their respective career paths and to hear about their careers – from graduate students and post-doctorate students to distinguished faculty and medical doctors. Overall, this has been a valuable experience that I would recommend to my peers as an opportunity to develop research skills and to sharpen focus on future pursuits. Peptides are promising cancer-targeting agents—they are small, chemically stable, easy to synthesize, and can be readily conjugated to toxins, radionucleotides, or drugs. We hypothesize that by screening peptide combinatorial libraries against cancer cell lines, peptides can be selected and engineered to recognize the integrins a3, which is important for tumor cell metastasis. The “one-bead one-compound” (OBOC) combinatorial libraries developed in the Lam lab consist of millions of beads, each displaying one unique peptide entity. From our previous screen, we observed that the breast adenocarcinoma cell line (MDA-MB-231) bound to the LXY3 peptide sequence. Nine OBOC-focused combinatorial libraries containing the LXY3 peptide sequence were synthesized and screened against breast adenocarcinoma. We selected the candidate peptide sequences that displayed a high affinity for the MDA-MB-231 cells using the whole cell binding assay, an in vitro approach for quantitating the strength of peptide interaction with cell surface molecules on the cancer cells. We are currently analyzing the data to determine the specific sequence requirements for high affinity binding. Further assessment of the affinity and kinetics of integrin-peptide binding will be performed using flow cytometry. Photoactive yellow protein (PYP) is a bacterial photoreceptor whose major function is to move the bacterium in response to blue light. PYP undergoes a photocycle where the protein unfolds to form the signaling state. The extent of protein unfolding is debated due to discrepancies between structures obtained for the protein in crystal and in solution. The first objective of this computational study was to compare Protein Data Bank (PDB) structures of PYP receptor and signaling states using Visual Molecular Dynamics (VMD) software. While crystal structures showed little difference between the signaling and receptor states of PYP, solution structures indicated displacements in the protein backbone as large as 10% of the protein diameter. Structural changes in PYP have also been characterized by Förester resonance energy transfer (FRET) from the unique tryptophan residue (W119) to the PYP chromophore, p-hydroxycinnamic acid. The second objective of this study was to use PDB data to calculate FRET efficiency between Trp and chromophore in wild-type and mutant PYP. FRET efficiency was calculated by determining the distance between W119 and the chromophore, the relative angle between the transition dipole moments of donor and acceptor, and spectral overlap between Trp emission and chromophore absorption. This calculation will be repeated for double mutants simulated in VMD, where W119 is removed and a new Trp residue introduced in different locations of the protein. These calculations will be compared to experimental Trp fluorescence lifetime values in the PYP mutants to test the accuracy of structural models of PYP. Center of Biophotonics summer program is not your average summer internship program. It far exceeded any expectations I had. This program has left a huge imprint on my academic growth. I had the opportunity to work in Professor Delmar Larsen’s Lab. My experience in this lab surpassed all my previous lab experiences. Under the guidance of Dr. Carroll, I learned about the importance of studying photoreceptor proteins. My problem solving skills were challenged every day, and with their help I was able to accomplish more than I thought I was capable of. They not only helped in my own specific summer goals but encouraged me to participate in the larger scale experiments. My success in the CBST program would not have achieved without their mentorship. In addition to the lab experience we had weekly intern meetings. These meetings were invaluable to me acquiring the skills to present and articulate the work I had done throughout the summer. CBST created a support group. The various group activities created friendships where I least expected. It was great to be able to count on people with similar goals and obstacles as me. Included in our activities was attending the annual CBST retreat in Olympic Valley. It was a great first experience to what academic conferences encompass. It was a chance to talk to other scientist in a more relaxed setting. I encourage all students looking for THE summer program to apply. Given the chance I would definitely participate in CBST summer program again! Synthesis of neurotransmitters, maintenance of our immune system, regulation of mental processes and mood, formation of red blood cells, and many other metabolic functions require the biologically active form of vitamin B6, pyridoxal 5’-phosphate (PLP), a chromophoric cofactor present in over 4% of known enzymes. In the enzyme, as well as in solution, PLP binds amino acid substrates to form “Schiff bases,” the thermally-generated product of which are: pyridoxamine 5’-phosphate (PMP) and the corresponding keto-acid. Presented here include experiments irradiating the PLP-dependent enzyme aspartate aminotransferase (AAT) with 440 nm blue light resulting in dramatic enhancement of catalytic activity. This increase in rate occurs by hastening the thermally rate-limiting quinonoid generation with formation of a photo-induced triplet state. Further studies that explored the influence of light on this rate-determining deprotonation step showed an inverse kinetic isotope effect (KIE). This study investigates possible reasons for these observations through comparison of AAT with its simpler model, isolated PLP-aspartic acid Schiff base in solution with the assistance of a UV/Vis spectrophotometer and high intensity LEDs. Quantitative measurements show that the PLP-schiff base in solution has an inverse KIE as seen in the enzyme. More experiments to investigate the possible causes of this inverse KIE will be conducted. Our findings will help build a greater understanding of protein-chromophore interactions, which will assist in creating a clearer picture of enzymatic processes at the molecular level. Participating in the CBST summer internship this summer has really opened my eyes to all the opportunities there is out there. I experienced a lot of “first times” such as my first time doing research, first time giving a scientific presentation, and most importantly, my first time obtaining a chance to work side by side with other students who are extremely brilliant and have the same aspirations as I do. The first week intensive helped build the foundation for a great summer internship. It allowed for all of us interns to get acquainted with each other and to bring out the best in us individually and as a team. Attending the CBST annual retreat was not only fun but it was also a learning experience as we got to interact with professionals in the biophotonics field. The weekly seminars aided in how to choose our career paths and also offered a massive amount of information on how to be competent and successful on our journey. The staff members are extremely helpful and have made this experience really one of a kind. The interns that I met showed me that we are all on the same boat, and even though we encounter a lot of obstacles, doubts, and hardships, as long as we stay motivated and keep pushing, we will all get to where to we want to be. Thanks CBST for everything and for reassuring me that this route into science is the way I want to go! Cancer is the leading cause of mortality and the risk of being diagnosed with cancer increases as the population ages. Hematopoietic stem cell transplantation (HSCT) is a last resort treatment administered to patients after the cancer has spread throughout the body and also serves as a therapy for patients with blood-borne cancers and other hematological diseases. During this treatment there is a period of time in which the patient is immune compromised and thus more susceptible to opportunistic infections and relapse of the tumor. Immunotherapy using natural killer (NK) cells may represent an effective treatment for killing and preventing the tumor relapse. NK cells have also been shown to be the first population of cells that recover after HSCT. Treatment with the cytokine interleukin-2 (IL-2) has been shown to increase the growth and activation of NK cells. IL-2 also increases the growth of T regulatory cells (Tregs) which are responsible for suppressing the immune system. One mechanism by which Tregs suppress the immune system is by secreting transforming growth factor-beta (TGF-ß). Previous studies in our lab have shown that performing a combination treatment of IL-2 with anti TGF-ßmonoclonal antibody (clone 1D11) accelerates the reconstitution of NK cells after HSCT in mice. Currently we are interested in improving the reconstitution of the immune system after HSCT and looking at the effect of the combinatorial therapy of anti-TGF-ß/IL-2. We hypothesize that this therapy will improve immune reconstitution by enhancing NK cell expansion and proliferation while minimizing the expansion of regulatory signals. Wow! I can definitely say that I was not expecting this summer to turn out the way it did. First of all the people that I have met were amazing. The group was so diverse and some interns were from areas outside the Sacramento area. I enjoyed the first week intensive so much. The activities were fun and they helped us interns get a chance to get to know each other. I also think the activities allowed me get to know myself a little better as well. I loved the workshop titled Challenging Stereotypes amongst others that help build character and teach about things that one doesn’t necessarily learn in a classroom. For some reason when starting this internship I thought my experience would be all work and little to no fun, but I couldn’t have been more wrong. I enjoyed the retreat, workshops, activities, poster presentations, the symposium, and all the students and faculty. The hard work was balanced with fun unique experiences. I would definitely recommend this internship to any student interested in pursing a career in the science field. The experience gained from this summer internship opened my eyes to the field of clinical research. At the end of the day I was simply amazed by how much I learned. The exposure to scientists that were willing to take the time to thoroughly explain the concepts behind every experiment allowed for a valuable lab experience. We were then allowed to make our own project decisions based on the concepts learned. We also got the opportunity to practice networking skills with the scientific community at the Lake Tahoe Annual Retreat. The opportunity to practice these skills will benefit me when I attend conferences, such as SACNAS. Also the lectures at the Lake Tahoe Annual Retreat showed me the progression science can achieve through the advances in microscopy. Outside of lab we had the chance to network with our fellow interns who share the similar career interests. As a group we had the chance to exchange ideas on how to get to the same career goal. At the end of the internship we were given a chance to present the work completed over the summer in front of all our fellow interns. I valued this component of the internship because speaking in front of a group of people is a skill that improves with experience. Overall, CBST summer internship was an excellent experience and the techniques learned will be useful in the future. Recent studies confirmed gold nanoparticles (AuNPs) are useful as a cancer medicine. A novel approach in cancer therapy may use AuNPs in the following way: AuNPs will first be injected into the human body after early detection, travel and enter the cancerous cells, possibly penetrate into the cellular nuclei, and upon x-ray radiation, induce apoptosis when the AuNPs absorb x-rays and emit electrons, which create hydroxyl radicals that damage the DNA of the cell; however, the electrons can also directly damage the DNA if the AuNPs are close enough. AuNPs were synthesized according to modified Wong and Brust methods and the particles were capped with poly ethylene glycol (PEG). The AuNPs were then purified by dialysis for 48 hours. Using Transmission Electron Microscopy (TEM), we determined the diameter of AuNPs. Cervical cancer (HeLa) and medulloblastoma-derived (DAOY) cell lines were used in this study. Both cell lines were maintained and grown in DMEM with 10% fetal bovine serum (FBS), and placed in a 37oC and 5% CO2 incubator to facilitate dispersal. The cell lines were treated with 0 and 0.1 µM AuNPs, then irradiated at 1Gy/min at different radiation doses of 0, 2, 4, 6, 8 Gy. Cell survival was measured by the clonogenic assay. In addition; the MTT assay was used to test the cell toxicity of the AuNPs. My summer internship with CBST was one of the most incredible, enjoyable, and unforgettable experiences that I could have asked for. This internship has not only allowed me to gain a substantial amount of knowledge both in science and research, but it has also prepared me professionally through its weekly seminars. The seminars have given me many new abilities including overcoming stereotypes, writing abstract papers, giving oral presentations, creating resumes, and more. My mentors and PI have been really helpful and patient. Working at the nanoscopic level was challenging; however, it was a great way of improving my laboratory skills, which was very rewarding. It also sparked my interest in nanotechnology. The CBST annual retreat was sociable, yet at the same time it was educational. The retreat helped me to improve my networking skills, while allowing me to bond with fellow interns. It is comforting to have people that I can relate to, who are also aiming towards the same career goals. All of the interns were very supportive, and Dr. Ana Corbacho and the CBST staff were very encouraging as well. For me this program is greatly beneficial since I will be attending UC Davis this fall. I was able to explore the campus and learn many of the available resources prior to the start of the academic year. Above all, I am truly grateful and fortunate to be a part of this program. By being part of this program, I feel like I am a step closer to reaching my academic success.